Enjoy Au Vieux Duluth Restaurants’ friendly service and welcoming ambiance. We offer award- winning grilled specialties and seafood dishes, generous servings, great value and the Bring Your Own Wine/Beer concept. 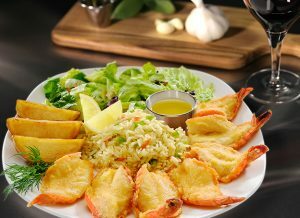 Come savour Au Vieux Duluth’s world-famous butterfly shrimps, tender chicken breast and brochettes, as well as our signature certifed AAA Angus Beef filet mignon served with our very own wine sauce. Take advantage of our limited time special offers! Hurry in and enjoy them before they’re gone! Do you have an anniversary or a special occasion coming up? You’d like to treat a friend or family members? Or do you just need a great gift idea? Au Vieux Duluth’s gift-certificates are perfect for all occasions and are sure to please. We have restaurants all over Quebec you can visit. For more information, please contact your nearest Au Vieux Duluth Restaurant. Gift-certificates can only be purchased in restaurants.